Seems that blogging is a great way to procrastinate. About the only time I update this blog is when I am prepping for a speech! Tomorrow, I’m speaking to a group of Hillross’ top 20 Financial Advisors on “How to thrive in the Digital Age”, and how hyperconnectivity transforms people’s behaviour and needs, including their material and social needs. 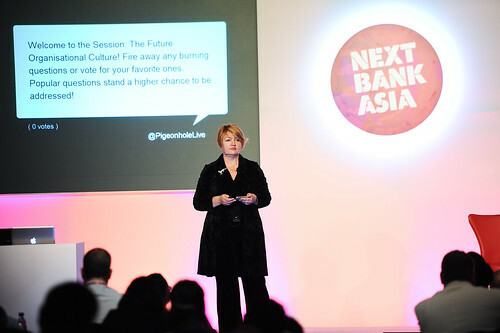 And here I am blogging…mostly because I just received the photo above from Next Bank Asia team where I spoke in Singapore earler this year. And then next week, at the launch of Women In Technology International (WITI) network in Australia, organised by the wonderful Bronwyn Edwards and sponsored by IBM. Man or woman, and interested in the way technology shapes or sinks careers? My talk will be on “Futureproofing yourself”. Over drinks and refreshments at IBM’s St Leonard’s Centre, you will meet great women and men who share a passion for technology – it will be an inspirational and fun evening, and this launch event has no entry fee! Founded in 1989, WITI is the premiere global organization which aims to empower women in business and technology to achieve unimagined possibilities and transformation through technology, leadership and economic prosperity. WITI was founded in 1989 to help women advance by providing access to and support from other professional women working in all sectors of technology. See you there! Now, best get back to speech writing! How $13,125 million was spent on nothing in Sydney today. Jane Rowland Smith on I’m Back!